Bad news for all those Americans who always claim, we Indians are the last set of creatures to be consulted on self hygiene or worse the word hygiene in itself. They say, they would prefer to hook around with few chaps from Somalia on this topic but not Indians. Their claims increases few folds when it comes to our eating habits. They say we don't carry an iota of sense on what we are eating. Junk food is call of the day for everyone as alone in Delhi we have more roadside eateries than the whole world put together. That's what they claim. This food habit they say is the primary reason of India having the largest collection of Pot Bellies in the world. I agree we are somewhat, if not entirely in line with what the Americans say. I agree we are very fond of soiling in open fields, side of train tracks or elsewhere with a lota in hand. I agree spitting is our national pass time. Yuk Thuu!. I agree we care an ounce or even less on what we eat or if we have a pot or tanker belly. I agree we love our food and don't bother much if it is from a roadside eatery or five star hotel or any Bideshi outlet like MacDonald's. But all that's going to change and change soon. Revolution is in the air. This is the reason I started with, the blog could be a bad news for the Americans as their stand on we Indians is going to be crushed handsomely. I am not too sure on the hygiene part and how fairly we would perform there but on the eating habit, be ready, the world we are coming with a revolution. Thanks to one of my office friend who is going to accomplish it single handed. Jolted by a sudden bout of health consciousness and his subsequent visit to a doctor to get some professional gyan coupled with his decent period of stay in the US, he thought it's about time something is done towards his own health and eventually changing the Americana's perception towards us. I missed the time when he used to be as erratic as any common Indian as far as eating food was concerned. But not now. After having a heavy dinner (sponsored by another friend, for the birth of his 2nd baby boy) we headed towards the nearest Paan shop to honour our National Pass Time. Once all were done with prescribing their favorite Paan to the Viku Mahatre look alike gentleman behind the counter, this friend of mine, whom I have never seen chewing anything, let alone a Paan came forward to order his item. 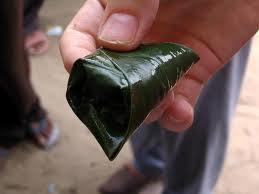 Do you have any Sugar Free Paan by any chance? . Viku Mahatre having a knowledge base strictly revolving around Paan only seemed confused on the Sugar Free aspect of it. The look was more tilted towards losing a customer, or God knows how many more in the future for not having one Sugar Free variety. Nehin Sahabji. Kolkatta hai Banarasi hai par yeh Sugar Free nehin hai. Wese yeh Sugar Free kaunsa Patta hai? Get your guns ready Viku Mahatre. We are in a mission to prove all those Americans wrong. Don't we? I must say my friend is not the first one to start the mission. There is a cigarette company who started all this, if not as violently as my friend did. As I said before we love our food and Tadka with all those lovely spices is a must in everything we gulp down. The CEO of this company thought of relieving all those smokers who are deprived of the Tadka factor in cigarettes. Hence came to the market a new stick having all the flavour of Tadka, the moment you light it. All the Elaichi, Dalchini, labang. Everything rolled into one. Hey Americana's, do you have any answer to this invention of ours? I bet you haven't and dare you try even. How small these steps might be we are going to make these buggers keep their mouth shut in future. None would be seen maligning our reputation. It is not late before we would come up with cigarettes with Strawberry flavor and Gutka or Paan with our very own Mango Flavor and of course the Sugar Free Paan is already in the process of manufacturing. Good job done!